I have to admit that I wasn't really sold by the first two episodes of this show but I suppose the third time is the charm. 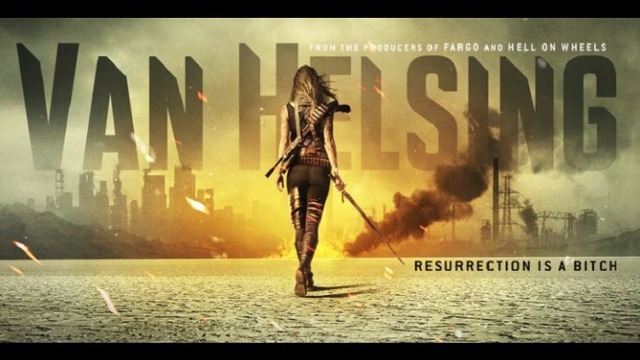 There's a lot going on with Van Helsing and the acting is pretty damn good. When we last saw the now human Flesh, he had crawled out of the disposal where Axel had thrown him. Flesh is confronted by the people of the hospital, who quickly realise that he's human. This means that there's no more doubt about the fact that Vanessa isn't just like everyone else and that fact means even more fear and paranoia. Things become complicated when the vamps decide to use John's wife as bait. John grabs Vanessa and heads up to the roof with Axel and the others fast on his heels. John's plan is to simply throw Vanessa off the roof but the vamps want her alive. The vamps want to exchange John's wife for Vanessa and they have no problem torturing the woman to make it all that more appealing. Vanessa seeing the desperate plight of the woman is willing to agree to this. Axel remains pragmatic and argues that John's wife died the moment he left her behind. As you might well imagine, this does not go down well with John and he grabs at Axel's weapon. The two struggle but Alex retains control and counters by shooting John's wife dead. I suppose you could call that problem solved but you just know that this is going to lead to even more problems. Unfortunately, in the struggle, the men manage to know out the power to the UV lights and with the battery only good for three hours something must be done about it now. Axel knows where he can get the parts but makes it clear that this is going to be difficult. Vanessa of course wants to tag along but Axel doesn't think that this is a good idea. When Axel does finally relent, he does so in the belief that once Vanessa is finally outside of the hospital she will finally see for herself that there's no way that her daughter could possibly be alive. Axel takes off and leaves Sam and Mohammed in charge. At this point, I think that people are following Axel not because he's made the best decisions but because he represents the last vestiges of the society which has been destroyed by the vamp take over. It will be interesting to see as the show moves forward whether or not Axel remains in a leadership position. So far, anyone who has challenged him has promptly gotten the smack down. So, Vanessa and Axel take off on their little road trip and John quickly jumps on the opportunity for revenge. With only three hours of power left, he encourages everyone to kill the doctor and Flesh, in direct contradiction of Axel's orders. No worries though because it's Mohammed and Sam to the rescue. It's Sam who stands up and Mohammed who reveals his intent. As partnerships go, I really do find these two interesting. We rarely see disabled characters in dystopian type stories and so Sam is unique. That being said, there's a racial aspect between them which is uncomfortable because Mohammed clearly follows Sam's lead in all things and seems to obey direct orders. I know it's only episode three, but Van Helsing really needs to explain the backstory of these two and why Mohammed seems so content to follow orders from a white man. Vanessa and Axel make it safely to the place where they need to pick up parts. Unfortunately, the parts are under water and so Axel dives in, leaving Vanessa to watch his back. Naturally, it's not long before the vampires come calling. Vanessa struggles to get Axel to surface as she fights off the vampires. Axel surfaces with the part he needs but finds himself in a battle. Vanessa gets overtaken by a vampire who promptly bites her. The vampire backs off and collapses into a fetal position. Axel is shocked that Vanessa manages to survive. They talk about the fact that her daughter is probably dead - something which Vanessa now accepts and Axel's vow to go wherever Vanessa goes because she's his top priority. You just know that there are going to put these two into a couple. Back at the hospital, it's time to lock and load because the power has gone out. The vamps, sensing weakness, are starting to move in for the kill. The humans all gather at the door but things are looking quite desperate. Flesh steps to the front and confronts the vampires with the news that he's now human. To prove it, Flesh slices open his arm and warns them all that if they come inside, Vanessa will turn them all as well. That's enough for the vampires to decide that they want no part of this and they take off. Axel and Vanessa who've watched the whole thing from across the street hurry into the hospital certain that the vampires won't stay scared for long. Vanessa stops long enough to grab the dead woman and bring her body inside. Flesh is at work sewing the wound in his arm as Vanessa talks about not fitting in and how he feels about being human now. Flesh is clearly troubled because while a vampire, he killed his five year old daughter, ripped the heart out of his infant and left his wife with parts of their dead children strewn around the house. It's clear that he feels guilt and shame for what he did as a vampire and believes that he deserves to die. Flesh explains that when you're a vampire, you don't feel any emotion whatsoever. Flesh does however ask Vanessa that if they find his wife if she can turn her back because he believes that his wife would like to feel again. Having gotten the power up and running, Axel's next task is to tend to the Doc. He's taken care of her through thick and thin and feels that he owes the good Doctor for saving his life. Axel asks Vanessa if she can cure Doc and while she's not sure she can, Vanessa is willing to try. Axel opens the cage and Vanessa enters but Doc immediately tries to get as far away from Vanessa as possible. It seems that Doc knows that biting Vanessa will bring about the end of her vampire days and so she struggles to keep her mouth tightly shut. Having enough of playing keep away, Vanessa simply bites Doc on the shoulder and backs away as Doc falls to the floor. Axel cautiously enters the cage, worried that Doc is dead and not in fact human again. After a few tense moments, Doc becomes human again. This is once again definitive proof of why Vanessa is vital to humanity. The vampires that Flesh scared off make their way back to report that Flesh is now human and his promise that Vanessa will turn them all. That's enough for head vampire dude to be called in. What got me the most about this episode is Flesh. He really isn't responsible for the things he did as a vampire and yet he clearly blames himself. It's easy to understand why he feels he cannot live with himself given that he killed his wife and child. What it does however suggest is that turning the vampires human is only the beginning of the battle. These vamps once turned are going to be in a world of emotional hurt for their actions while vampires. They are going to suffer from PTSD at the very least. I really hope that Van Helsing sticks with this theme because it means that reversing the woo woo is not the end of the story. Speaking of woo woo, it's time for Van Helsing to start giving us some clues as to why it is that Vanessa's blood is so special. From the name of the show, it's easy to guess that it must be something to do with her famous last name /lineage but I really want to know more. Having her running around curing people while ignorant is only going to be interesting for so long. People need a reason to believe in the chosen one for this trope to work. Right now, despite Vanessa's chosen on status, Axel is clearly in control and he is being backed up by both Sam and Mohammed. I am curious to know how long Axel is going to hang onto his tenuous power? Now that the Doc is human, we might get some real answers from her about Vanessa and that will greatly change Vanessa's relationship to everyone on the show. For now, Axel needs Sam and Mohammed, who I think we need to pay attention to going forward. In terms of able bodied and disabled, they are an interesting pairing but the racial dynamics aren't great. There's a pretty large cast of characters right now but we really haven't gotten to know any of the women. I wonder if they are going to be more than window dressing going forward? It would be quite easy for Van Helsing to focus on Vanessa and pretend the other women in the group don't exist and thus far, I haven't seen any evidence that this isn't their plan.